If your Xbox One console won't turn on, your power supply may be faulty or improperly connected, or there may be another reason. Try the following solutions. Which console are you having power problems with? Important Be sure to try all of the following solutions. If you don't, you could mistakenly request a new power supply when it's your console that needs repair. The Xbox One S and Xbox One X have an internal power supply that works in all regions worldwide. If your console won't turn on, it may simply need a power reset. Often, power issues are due to the power supply resetting after a power surge. Unplug the power cord from the console. Plug the cord back into the console, and then press the Xbox button on the front of the console. If the console turns on, the internal power reset worked. Do this step in the future if the problem happens again. Check that the wall outlet you are using is working with other devices. Check that the power cable is firmly connected to the wall outlet and to your console. Ensure that you're using the power cable that came with your console, and that it's the correct cable for your region. If your console still will not turn on, it will need to be serviced. To request service, sign in to the Device Support page with your Microsoft account credentials and submit a service order. 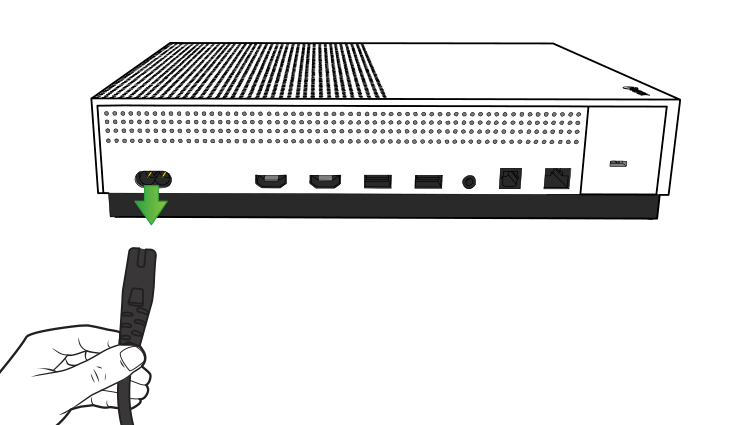 For further help with the original Xbox One console, see the Xbox One Power Supply Solution. Would you like to contact Support regarding the "Your Xbox One X, Xbox One S, or original Xbox One console won't turn on" issue you were reading about or a different issue?